Dayana Trigo Ramos was born on March 7, 1990, in Cuba, Havana City. She lives and works in Havana City. She graduated from the National School of Fine Arts “San Alejandro” (2009) and Visual Arts Faculty of Higher Institute of Art (2014). Her first installation Metropolis (2006) was part of the collateral projects of the IX Biennial of Havana. 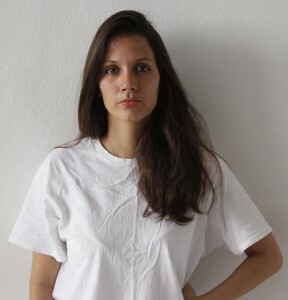 She participated in S-T, a collective exhibition in May, 2009, at Cultural Center of Stockholm, Sweden. She was a member of the 4th Pragmatic and educational project of the artist René Francisco Rodríguez. During the period of 2010-2013 in the 4th Pragmatic, she made exhibitions such as CLASSPOOL, BANKRUPTCY and TRUST, including her participation in the 1st TRIENNIAL “OFFSIDE EFFECT”, in Georgia (May, 2012) and in CARTOGRAPHY OF THE IMPOSSIBLE, at the Center of Contemporary Art Wilfredo Lam (April, 2013). With the 4th Pragmatic, she was invited to the XI Biennial of Havana with the GENEROUS CITY project. Her first solo exhibition was THE SICKNESS OF OBLIVION (2013). In 2014 she presented the solo exhibition PERPETUAL CIRCULATION, research to get her Bachelor Degree of Fine Arts.